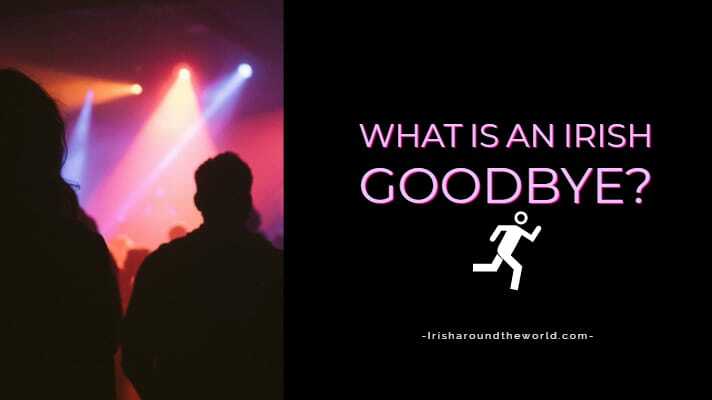 What You Need To Know About An Irish Goodbye - AKA "An Irish Exit"
Ever hear the expression “Ah sure he did an Irish goodbye”? Well, it is actually quite a popular party trick. What is an Irish goodbye? It is basically when you leave somewhere unannounced. Basically, you sneak out of a club, party, pub or any establishment you are in. There is a certain whimsical joy to the whole process. If you have ever done an Irish goodbye you know exactly what I am talking about. Some of you might be saying, why the hell would anyone do an Irish goodbye/exit!? Well good question, well for starters it is fun! Your first Irish goodbye will be a thing of bliss. Think about it, the party is going on till 6 in the morn and you have a sudden moment of clarity. Not only are you saving breaking up the party mid-party but nobody really cares. And that is about as much of a mention you will get when you do an Irish goodbye. Is an Irish goodbye rude? Obviously, there are some situations where you shouldn’t just disappear. Like at the start of a party haha. But honestly, people will likely not even realise you left nor care that you left. In a way you are actually doing a good thing, the host can carry on hosting without having to interrupt the conversation and put a downward spin on the party. Unless you make it a regular habit the Irish goodbye is one of the easiest ways to leave without anyone noticing. You will get a few hours extra sleep and subtract a few beers so it’s a win-win! The Irish goodbye is practised all around the world, even by the many Irish living in Australia. Don’t forget to send a text or let possibly one person know. The last thing you want is someone freaking out and asking around looking for Stephen. If you plan an Irish exit in advance it can make for a spectacular disappearance. People have who have done a few of these can almost completely get away with a swift exit. Have you done an Irish exit in the past? Be sure to share and comment below. P.S If you love all things Irish like Irish jokes, recipes and heritage you will enjoy my weekly email. Every Friday I send out a brief summary of what has been happening on the site. You can even do an Irish goodbye and unsubscribe if it is not your cup of tea haha. Join here! Is there any other way to leave?? ?.